After last week’s sadness over the violence in Tucson, it was good to watch thousands upon thousands of people pour their hearts into service yesterday in honor of Martin Luther King Jr. Day. I am one who believes the good news far outweighs the bad, if we pay attention. Yesterday was a day to pay attention to the people who are committed to their communities, and want to leave a positive stamp on those communities. 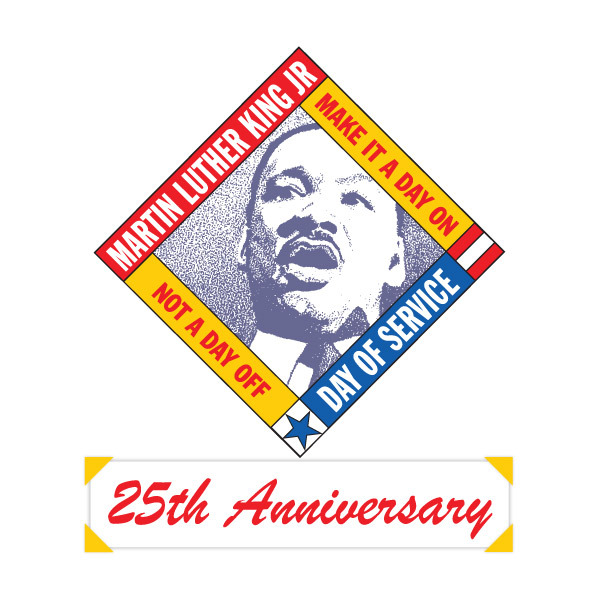 In honor of the 25th anniversary of Martin Luther King Jr. Day, the people behind the National Day of Service have come up with a terrific way to extend the day into a whole year. The Corporation for National and Community Service is challenging all of us to commit to 25 acts of service in 2011. It’s called the MLK 25 Challenge. From simple acts like donating to your local food bank, to more involved things like becoming a mentor, anything that helps make your community a better place can be part of the challenge. If you’re scratching your head for ideas, the organization’s website has a handy checklist to get you started. See this blog’s posts from last month, when I listed 30 ideas for being a good neighbor at the holidays and beyond. The group is encouraging anyone who takes the challenge to post their actions throughout the year on Twitter, using the #MLK25 hashtag. Although the focus is on the Day of Service here in the U.S., Martin Luther King Jr. transcends this country. Anyone, anywhere on the planet could participate in this challenge. It would be amazing to see a Twitter feed with thousands of posts from all over the world, marking acts of kindness done in memory of MLK. To help me remember the challenge, I’ve posted a sticky note on the side of my computer screen that says “#MLK25”. I’m starting with a small goal of remembering to take reusable bags to the market. Another small act I realized I did yesterday: I momentarily helped a neighbor try to locate a missing pet. Little things, I know, but sometimes when we start with the little things, it leads to bigger actions down the road. I like to think that even a small act, like a small raindrop in a pond of water, sends out ripples far beyond what we may even realize. Think of each act of kindness – no matter how small – as a light against the darkness. When thousands of us shine our lights of love together, the darkness cannot triumph. What about you? Will you take the MLK 25 Challenge? What ideas do you have to help others this year? 2014 is off and running! Whether you made New Year's resolutions, intentions, ..
What's the biggest mistake people make when donating? I had an inkling Steven ..
A grassroots wave of people across the United States are performing millions ..